AMD presented a new roadmap along with a handful of details regarding their next generation Opteron chips which include the Toronto APU, Toronto CPU and Cambridge CPU. 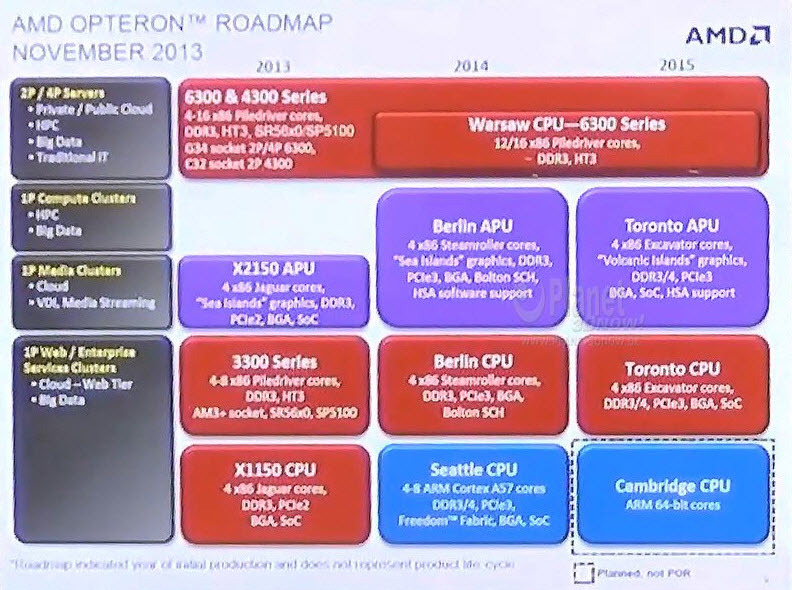 Surprisingly, the roadmap also gives a hint at the details of AMD’s Carrizo APU which is scheduled for launch in 2015. From the new Opteron roadmap, AMD seems to be sticking with their Opteron 6300 and 4300 series Piledriver based chips till 2015 for the 2P / 4P serivers. Yeah, no Steamroller or Excavator on the high-end multi-socket server platform but we are looking at new developments across the APU landscape with next generation Berlin and Toronto chips. We already know about Berlin APU which is based on the same foundation as AMD’s upcoming Kaveri APUs. Just like its consumer variant, Berlin APU would feature four x86 Steamroller cores and from the slide, it is revealed that AMD’s R7 series IGP is based on the Sea Islands architecture which is fused inside the Radeon HD 7790 and codenamed Bonaire XTX. That’s one chip of several variants which will be fused inside the Kaveri APUs offering Dual graphics support along side the Oland SKUs. Additionally, the A10-7850K and A10-7700K variants would feature unlocked multiplier for consumer platform while both Server and Consumer SKUs will support DDR3 memory, FM2+ socket or BGA, Bolton SCH and HSA / HUMA optimizations. Both platforms with feature native PCI-e 3.0 support. Berlin would be available in both APU and CPU variants for specific workloads. The APU variant would be focused towards the 1P Media Clusters which include Cloud and Media Streaming while the CPU variant with only the Steamroller cores would be used for 1P Web and Enterprise Clusters for big data purposes. Next up. we have Toronto which is the closest thing we have detailing the specifications of AMD’s 2015 APU codenamed Carrizo. AMD’s Carrizo APU have been detailed by us on several occasions and this confirms most of the information we have been detailing for the past few months. Toronto APU, just like the Berlin APU before it would provide us the details of the specifications AMD’s consumer APU would feature that is codenamed Carrizo. Powering the CPU side are four x86 Excavator modular cores which leverage the IPC for greater performance compared to Steamroller. The exact percentages are not known at this point by the improvement is rumored to be around 30% which is phenomenal for a new architecture from AMD. Ofcourse we still don’t know that what process the Excavator architecture is based on but previous reports point out to 20nm. On the GPU side, we have the Volcanic Islands core which is a great plus point for this level of APU. You should keep in mind that the Volcanic Islands graphics isn’t the codename for AMD’s Radeon R200 lineup but infact used to denote their flagship Hawaii based chips. This is a key hint that AMD’s next generation flagship parts would have the same improved GCN 2.0 architecture currently fused only inside the Hawaii chips which feature true AMD Mantle, AMD TrueAudio and AMD OpenCL optimizations. Another plus is that AMD would be shipping Carrizo with both DDR3 and DDR4 memory support so its highly possible that Carrizo would feature support on FM2+ boards with DDR3 memory and also a new socket that would allow DDR4 memory support. Both Toronto and Carrizo APU would share this foundation plus featuring support for PCI-Express 3.0 and HSA. The Toronto APU and CPU variants would be available in BGA and SOC variants where the SOC variants would have the southbridge planted on the APU die itself. This saves both power and space and optimizes workload offering a more coherent architecture approach which AMD’s HSA is all about. It was said during the AMD presentation that a complete system with the Toronto APU would have a max power usage of 70W. On the low-end side, we have Seattle CPU powering the 1P clusters with 4-8 ARM Cortex A57 cores and DDR3/4 memory support and Cambridge CPU replacing it in 2015 with 64-bit ARM cores. These are some good additions to the lienup but AMD still needs a true high-end desktop platform to replace their much outdated Vishera CPUs which unfortunately isn’t going to happen in the near future. GPU Branding Radeon HD 7000 Radeon HD 8000 Radeon R7 Series Radeon R7 Series Radeon R9 Series? Radeon R9 Series?